Next Meeting: Wednesday, July 11, 2018, 6:30 p.m. – 8:00 p.m. Program: Gallery Talk meets Show and Tell – Prepare to be Inspired! 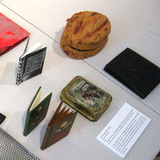 Pats on the back and hugs all around – the Book Arts Guild just concluded two amazing exhibitions of members’ work. Both shows (at Studio Place Arts in Barre and at Frog Hollow Craft Gallery in Burlington) feature pieces that intrigued and delighted viewers. Please join us in July as we explore together the wonderful pieces that appeared in both shows. Contributing artists are invited to talk about the pieces that were displayed, sharing their inspirations, their aspirations and their processes. Expect to take home new ideas and an invigorated appreciation of the creative process. 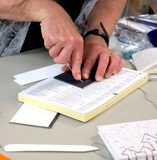 In June, Jill Abilock took us on a two-hour hands-on adventure into the world of Coptic bindings, a stitch dating back to the 2nd century AD. She guided us through the steps of a method that is her own personal twist on both the binding and cover attachment: her method requires punching fewer holes in the cover, has no thread lines on the inside of the cover that might mar the first or last pages of the book, and delightfully incorporates embellishments as an intrinsic part of the binding. Jill brought in samples of her own work, which were both elegant and inventive, incorporating unusual materials like wire, fancy paper clips and beads. She provided upcycled materials cut to size from discarded library books for everyone to use to create their own mini artist journal, and templates to take home should they want to make another one. Thanks to everyone who came to the meeting and even more to Jill for sharing her talents! *** We’re so sad that both B.A.G. exhibits are over now, but we can always dream about next year! All pieces that were shown in both the Frog Hollow and SPA exhibits will be at the July meeting for pickup…unless you sold them, in which case – good for you! * If you are unable to pick up your work at the meeting, please contact Marcia to make alternative arrangements. For those of you who missed our exhibits, don’t worry! You can view images of all of the pieces in both the SPA exhibit and the Frog Hollow exhibit on the B.A.G. blog. *** ArtisTree Gallery‘s 8th annual juried exhibit, UNBOUND: VOL VIII, will open on July 27th and run through August 25, 2018. This exhibit is opening in conjunction with the kick off of the 10th annual Bookstock Literary Festival in Woodstock, VT. The broad theme of UNBOUND: VOL VIII encompasses all of the possibilities of what we may think or may not think a “book” is. Is it story? An entry to another world? An exploration? What does it indicate? This juried show looks to explore this idea of “the book” and all the ways artists use that format as a stepping-off point or as material to explore new ideas. An opening reception will be held on Friday July 27th, from 5:30 p.m. – 7:30 p.m.
For more information, please send an email to gallery@artistreevt.org or visit the ArtisTree Gallery’s website. *** Now through July 22nd, Susan Kapuscinski Gaylord has fourteen of her Spirit Books on exhibition in the Hunnewell Building Visitors center at the Arnold Arboretum of Harvard University. The Spirit Books connect my experience of the inherent spirituality and mystery of nature with the long-standing tradition of books as testaments of faith and belief. I gather twigs, branches, vines, and roots and use them to cradle stitched wordless books made of handmade papers from around the world. The Arnold Arboretum is located at 125 Arborway in Boston, MA (Google map). For more information, please visit The Harvard Gazette’s website. *** From June 11 – October 1, 2018, the John J. Burns Library at Boston College is hosting the exhibit Dreams of Art & Glory: Book Arts by the Roycrofters. Roycroft, a reformist community of craftspeople and artists, was created by Elbert Hubbard in 1895, in the village of East Aurora, NY. The artisans who worked there were known as Roycrofters. When Hubbard was unable to find a publisher for his book Little Journeys, he set up a private press to print the book himself, founding Roycroft Press. His championing of the Arts and Crafts philosophy of work attracted many craftspeople to East Aurora, and he formed a community of printers, furniture makers, metalsmiths, leathersmiths, and bookbinders. The exhibition focuses on the printing and bookbindings executed by the Roycrofters, and includes an array spanning the modest *Little Journeys* pamphlet series, to beautifully printed and hand-decorated text-blocks, as well as books bound in stunning modelled leather bindings. The John J. Burns Library is located at 140 Commonwealth Avenue in Chestnut Hill, MA. *** Now through October 31st, artist Crystal Cawley has work on display in the Hat and Fragrance Textile Gallery at the Shelburne Museum in Shelburne, VT.
Cawley merges materials and ideas ranging from collections of old greeting cards and puzzle pieces to discarded library books and worn household textiles, drawing our attention to objects that might otherwise be overlooked. Visitors will encounter more than two dozen works combining the artist’s interests in the form and history of clothing and the possibilities of paper and fabric sculpture with traditional handiwork like embroidery, spinning, and letterpress printing. For more information, please visit the Shelburne Museum’s website. *** The second annual Artist Book Intensive will be held at 26 Split Rock Cove in South Thomaston, ME from August 3 – 5, 2018. The event is sponsored by Midcoast Book Arts. What is an Artist Book? Do artist books require words? Or images? What about structure as a part of the content? Yes, yes, and yes. Because artists’ books are works of art that use the form of the book. They may be published in small editions, though they are often produced as one-of-a-kind objects. And their subject matter is as varied as any other art form. Three book making structures and two decorative techniques for book covers and/or content in your books will be taught. All materials will be provided, along with a notebook containing the instructional information covered in the workshops and additional resources. For more information, please visit the Artist Book Intensive website. *** Maine Media Workshops + College is offering Pop-Ups for Miniature Books with Shawn Sheehy from August 12 to 18, 2018. By definition, a miniature book cannot be more than three inches in length, width, or depth. Working within this small format, students will learn how to bring drama and excitement to their pop-up book by inserting impossibly large images into a small package. Students will use cardstock and simple hand tools to build and bind, using a pop-up specific technique, a variety of structures that move above, beyond, and behind the page. Students will have time to experiment with their own ideas and recieve engineering advice from the instructor. No experience is necessary, but previous experience in fiber arts and/or paper craft will speed your progress. This content readily accommodates beginners and advanced makers alike. You will leave the class with a completed popup book and a good understanding of the basics of popup engineering. Once you’ve tackled the skills in small format, you’ll be able to scale up for future projects! For more information or to register, please visit the Maine Media website. *** The Women’s Studio Workshop is currently running its Summer Art Institute with workshops focusing on printmaking, papermaking, and book arts. They offer you time to focus on your work, become energized and inspired, learn new skills, and meet a new community of like-minded artists. Unfolding Practice with Arzu Mistry will take place from August 6 – August 10. This workshop is based on the artist book Unfolding Practice: Reflections on Learning and Teaching, created by Arzu Mistry and Todd Elkin. This workshop is for artists from a variety of disciplines, who are interested in sharing and developing processes of reflective practice, and to take a deep dive together into methods of using accordion books as sites for multi-disciplinary reflection, inquiry and art practice. Using a range of book forms and screen-printing techniques, you will document, reflect, plan, and think expansively about your practice as artists. We’ve Got the Blues: Indigo Dyeing for Paper & Cloth with Mary Hark will take place from August 20 – August 24. Participants will be immersed in studio production, making use of this powerful and historic color on handmade paper and a variety of textiles. Experienced dyers are encouraged to bring works-in-progress and ideas for new projects. Beginners will be introduced to the process of papermaking with fibers that are appropriate for this immersion dye process – such as Asian fibers, flax, abaca, and linen cloth – as well as shibori resist dye techniques. Each participant will be supported and encouraged as they use these processes and materials to expand their creative practice with the breadth of possibility offered by the indigo vat. 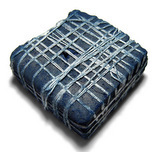 Studio work will be complemented by discussion of the historic and contemporary use of indigo; informal critiques of works-in-progress; and technical information for papermaking and dyeing in home studios and classrooms. Participants will leave with a deeper understanding of what this color can mean, a portfolio of beautiful samples of indigo blue on cloth and handmade paper, completed work, and the information necessary to continue on this path. For more information about the workshops or to register, please visit the Women’s Studio Workshop website.